It's not holy but it is beautifully put together! This review has been almost a year in the making! 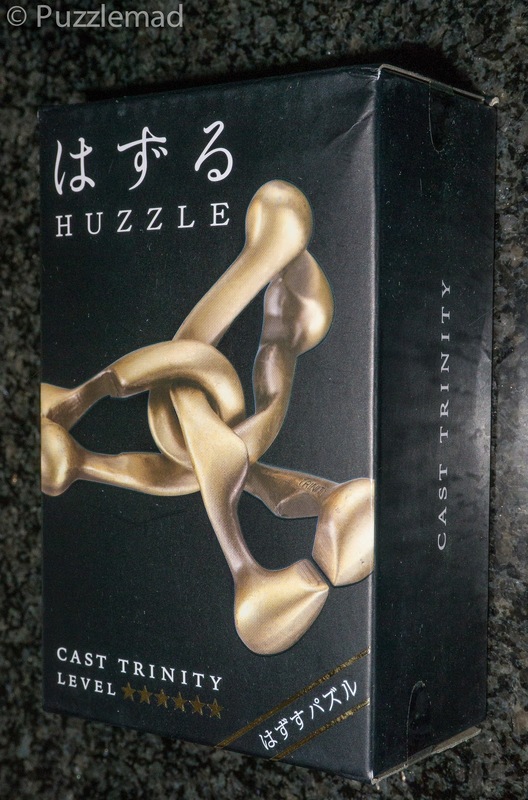 The Hanayama Cast Trinity was released in January 2018 and I was lucky enough to get a copy very quickly before they came to Europe from my friend Nic Picot who runs a puzzle store in the UK (Trinity is here). If you live in the Americas then it is probably best to buy from PuzzleMaster here - they have an incredible range of metal puzzles. I have carried this with me for 10 months and it has taken up until this week to solve it. I think this one well deserves its 6 out of 6-star difficulty rating (level 10 - Mind Boggling on Puzzlemaster's scale). 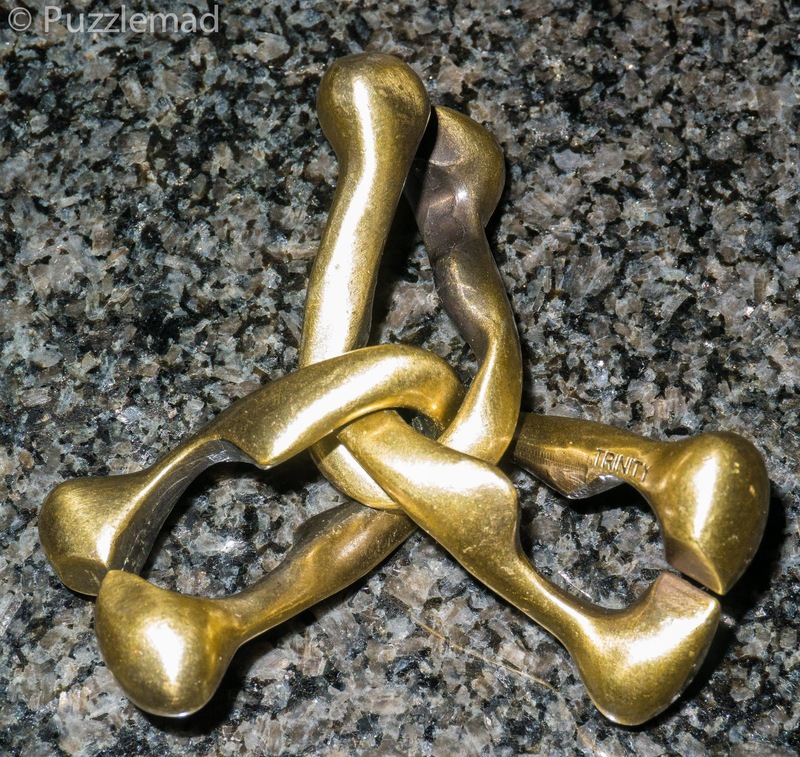 It was designed by Kyoo Wong and is part of Hanayama's updated range, now known as the Huzzles. I really do like the new packaging they have produced to go with the range and the Trinity, in particular, has a rather impressive black box. Despite the nice packaging, the boxes always go in the bin. I really don't have enough storage space to keep all the boxes for the 2000 odd puzzles in my collection. 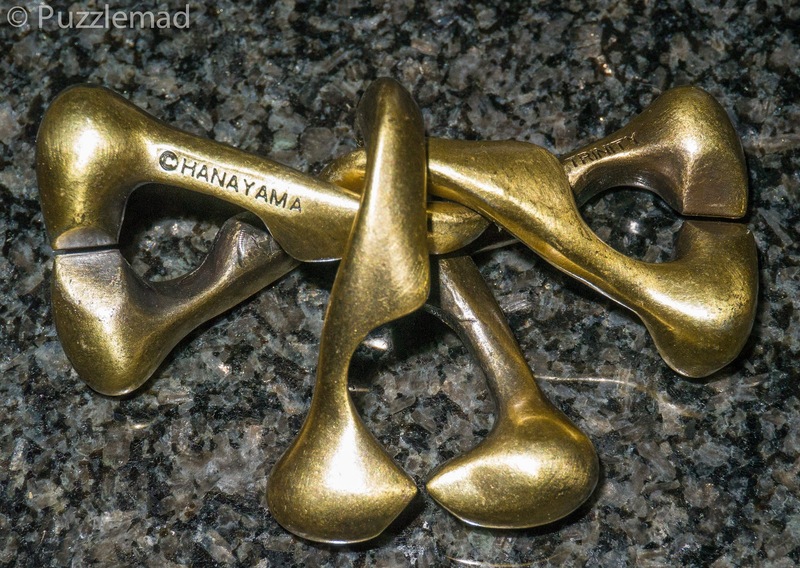 The three pieces here are cast in metal that has been made to look like brushed antique brass and 2 of the pieces have been stamped with the name Hanayama Trinity. This is particularly useful as it will help you keep track of what you have tried with each piece. At least, this would be the case if you either a) solved it fairly quickly or b) were brighter than me! I do always try to keep puzzle orientation fairly uniform during a solving process but this proved particularly difficult with this one. I have a friend at work who loves the metal take-apart puzzles and I have kept him waiting for a nearly a year - Steve, you will get your chance on Monday! When playing with it, the pieces rotate and slide through each other in numerous ways and at times get very tight. It is important NEVER to force the puzzle past this tight point - it is not necessary at all. When done correctly, the solution is perfectly smooth and easy with no catching. I initially thought of this as a simple disentanglement puzzle very like the simple wire puzzles everyone has played with. After just a few moments of play, it becomes clear that this is not the case. When I got the pieces into a similar position to the wire puzzles, I immediately realised that the third piece was going to block the movement but more importantly the "heads" of the pieces are formed very carefully to allow passage only with very precise orientation. If you examine the picture above then you can see that the top 2 pieces have a gap aligned in the direction of the length of the piece but the third one has the gap aligned at 90º. Time to Think© - preferably have the correct thoughts if you can, otherwise, like me, you might take a year to solve it! I had formed an idea of how I would separate two of the pieces to form a linear chain and then the final separation would be trivial. I am ashamed to admit that my first thought was completely incorrect and I could not get the pieces aligned to slide through each other no matter how hard I tried. The positions that you can get the pieces into is very constrained and 3 or 4 definite pathways seem to be possible but none of them allowed the alignment to be quite right - or even close! As with all of this type of puzzle, try to keep a muscle memory of what you have done so that you have any chance of a return to the start. A few months ago, whilst chatting to Ed (amazing blind puzzler) he shamed me by telling me that he had managed to solve it without too much difficulty and was even able to reset it too! This made me wonder whether using my eyes was making it harder. I spent a few rather ridiculous sessions attempting to do it with my eyes shut! This made a simultaneous watch of the TV with Mrs S rather difficult and I found that I could do almost nothing with it. Kudos to Ed managing it - I find that sort of talent totally unbelievable. The last 2 months I resumed puzzling with my eyes open and still failed. I would play for a few hours over a few days and then put it away again for a week or so. Thinking of Einstein's definition of insanity, I was forced to abandon my preconceived idea of how it might disassemble and spent a while just fiddling to see what new shapes I could make and the Aha! moment hit me like a hammer! What I had been trying to do was completely wrong and the real movement was something I had not conceived of being possible. Trying a totally new idea was still not a piece of cake, the positioning needs to be really very precise and there are definitely quite a few more moves than one would expect. Suddenly, a nice new position occurred and everything slid nicely until I had them in a chain and from there total separation was possible - even that is not trivial! The difference between the pieces can really be appreciated once the puzzle has been dismantled. I really thought that I had taken the right approach to remember how they had been oriented as they separated. I thought wrong! The reassembly proved another big, but very enjoyable, challenge. I did sort of recall the type of movement that was required to get all three interlocked but unfortunately did not remember how the individual pairs had been arranged as they slid together. For several hours I managed to make a number of different chains but the crucial interlocking move proved impossible again and again! Whilst frustrating, working this part of the solution out proved to be a great deal of fun and I think in the process I realised that it is possible to assemble the Cast Trinity into at least 2 more conformations that are similar, but not exactly the same as the true start position. Each time I realised I had assembled it nearly but not quite right, I had a little panic worrying that I might not be able to disassemble it and start again. Finally, on Friday night I had my final Aha! moment and it was back to the beginning. I do not know how many other assemblies are possible - if anyone knows then please leave a comment below. Even having fully disassembled it and returned it to the true beginning once, I still struggled to repeat the process. It took another hour or so before I was happy that I could repeat the whole pathway easily at will. Despite the 10 months it took to solve this puzzle, I really like it! This is definitely a level 6 and unlike the Cast Quartet or Vortex, is much more enjoyable. It is certainly a great choice for your collection and at £9/$16CAD provides a lot of puzzling for you pound or "buck". Go buy it here (UK) or here (Canada). Good job Kevin, that's a lot of perseverance! I too struggled immensely with this one, especially putting it back together. Always got all three pieces intertwined and then the horrible moment when I realize that it won't lay flat like it should because I have one of them flipped the wrong way. After an hour or two I would finally undo the monstrosity I had created and try another orientation. Overall took me around 7-9 hours solid (not straight, obviously!) 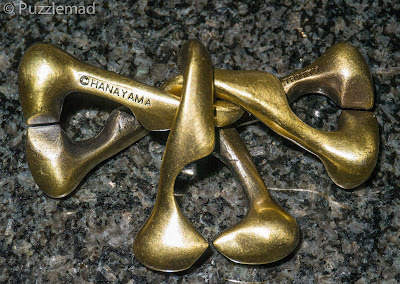 to solve, and having done so I think it's one of Hanayama's best. However Hanayama's next challenge, the Hourglass, I am sad to say was too much for me. Having successfully dismantled the abominable object after many (MANY!) a painful hours, I spent much more time than I would care to admit trying to reassemble it. Got lost somewhere in there and just could not get out of it no matter what I tried. I finally had to commit the cardinal sin of puzzling.. I resorted to YouTube. 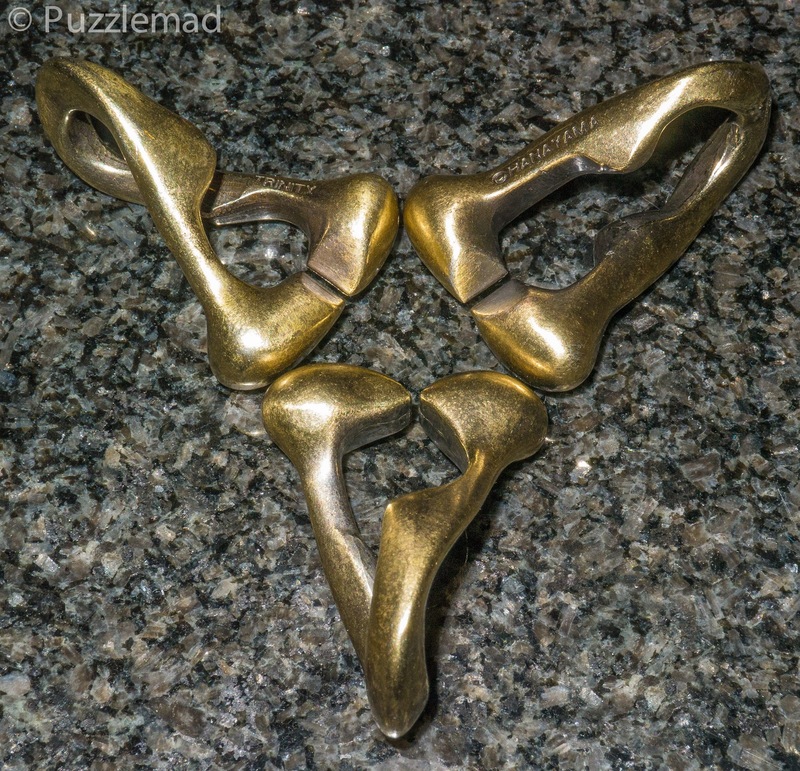 Having seen the full solution I have to say that I think this is officially Hanayama's most difficult and evil puzzle, even worse than Quartet. Might need to be rated 7 out of 6 haha. Looking forward to your thoughts on this one and whether you are able to succeed where I have failed! Have a good day and happy puzzling! I have so far failed to dismantle the Hourglass! It is a complete mess just now and I cannot seem to advance or go back! My "hourglass" was disassembled after several tedious hours. I left the 4 pieces on the coffee table so I could try reassembly after work and they disappeared! "She Who Can't Stand Things Laying Around" put them away during the holidays and I just found them again 2 days ago. I can't even remember where to start! I agree with Noah when he said it may be Hanayama's most difficult yet. Good luck! “She” sounds much less frightening than my own “she who must be flinched from” - at least yours doesn’t deliver a Whack! Ouch! Starting the Year With a Winner!